Phobjikha Valley lies is Western Bhutan and is most visited during winter months as it is the Protected roosting place of the Endangered Black Necked Cranes ( Scientific name is Grus Nigricollis). People visit this Valley during other months too as it is cool and untouched by modernization and the residents here are all farmers that practice Organic farming, potatoes being their main harvest. This valley also has the Gangtey Goenpa / Monastery, which is a Nyingma sect of Buddhism. The Black necked cranes fly from the Tibetan Plateau during Late October and roost in Phobjikha Valley till end of February the next year. 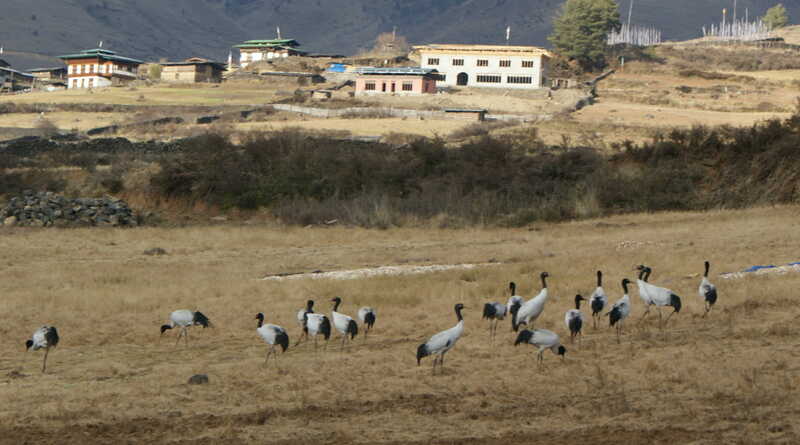 Every Year the number of cranes coming to this valley is steadily increasing due to the aggressive protection policy of Bhutan whereby no electric poles and wires are allowed to be exposed to avoid the Cranes from hurting. Also once they are landed in Phobjikha, the farmers are not permitted to go near the marshy, swampy roosting place of the cranes. There is also an alternate form of protecting the cranes. Its been long said that the Cranes are sacred even before the people knew that these cranes were Endangered birds. The locals here believe that if the Cranes arrive into this valley they will have bountiful harvest. The farming community here have since time memorial lived in harmony with these cranes obliviously of the fact that they were one of the endangered birds of the world. To highlight the Black Necked Cranes and to create awareness of its uniqueness and importance to the World, every year, coinciding with our Fourth King’s Birthday, the community gather at the Gangtey Monastery for the Black Necked Crane Festival that is held on 11th November. And one of the highlights of this Festival is the performance of the Black Necked Crane Dance that the children of Phobjikha Valley perform apart from the local dances. Its a small festival that brings together the local farmers, the stakeholders in protecting these Cranes and the tourists and visitors from all over Bhutan and abroad. There is a beautiful nature trail that entrails the whole Phobjikha Valley and one must take this walk if you visit this sacred valley.